Keep in mind that while I specifically refer to the iPhone below, most—if not all—of the new features are equally applicable to the iPod touch. The iPhone 3.1 update is free to all iPhone owners and iPod touch users who are running 3.0. iPod touch owners running a previous version will have to fork over $5 for the update which also, of course, includes all the features of iPhone 3.0.
iPhone 3.1 arrives in tandem with iTunes 9, so it’s no surprise that many of the new features are dependent on upgrading Apple’s jack-of-all-trades application to its latest version. Among the most heralded improvements brought by iTunes 9 is the ability to organize the applications on your iPhone’s Home screen via iTunes. Previously, rearranging the order of your apps meant laboriously dragging applications one-by-one to the edge of the screen, then waiting for the phone to shift to the next Home screen—moving it multiple Home screens was an exercise in self-control that all too often ending in weeping. 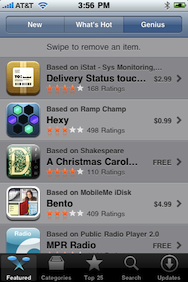 Most iPhone users probably gave up on keeping their apps organized around July 12, 2008.
iTunes-based app management greatly improves upon the existing Home screen organization. The revamped Applications tab appears in iTunes when you plug your 3.1 device into your computer. iTunes will give you a list of applications on your computer and a picture of your Home screen(s). You can sort the list of apps on your computer by name, category, or date and you can search them—handy if you’ve got a long list. Checkboxes next to each of the apps control whether or not they should be synced to the phone. The facsimilie of your Home screen, meanwhile, lets you drag app icons around just as you would on the phone itself. A small “x” appears when you hover over any third-party application, allowing you to remove it from the phone. You can drag an app icon to one of the thumbnails of your other Home screens or even rearrange the order of your Home screens entirely by dragging and dropping them. Home screen organization isn’t the only iTunes-based improvement in iPhone 3.1. Apple’s also improved the media syncing options. You can now synchronize music based on specific playlists (including Smart Playlists) as well as specific artists or genres. Movies that are on playlists can be called out for syncing, as can recent movies or recent unwatched movies. TV shows can be synced by show, season, or specific episode. Podcasts can now be synced by specific show or episode as well as by automatic options for unplayed or recent episodes. 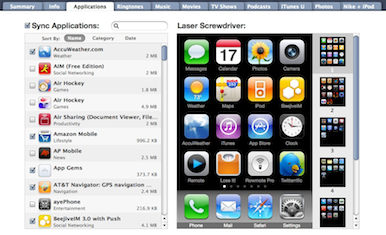 iTunes U content can be synced by specific collections or items. Photos can be synced by specific iPhoto Events, Faces, or Albums. The iPhone can also take advantage of iTunes 9’s new Genius Mixes, which automatically generates playlists based on your existing library without you even having to pick a song to seed them. Genius suggests iPhone apps for you based on your usage history—just in case you don't already have enough. Besides adding support for Genius Mixes, you can now use Apple’s Genius features to get recommendations for iPhone apps. You’ll need to activate this feature on the phone itself by launching the App Store app. The Featured tab now includes a Genius sub-heading; the first time you click on that, you’ll be prompted to turn on Genius and agree to the terms, which specify that Apple will collect anonymous information about your app habits (duration of use, number of launches, et cetera) and use them to generate recommendations for you and other users. The App Store then displays a list of recommended apps for you, each of them marked with the name of the application Genius is basing the recommendation on. From my brief time with the feature, it seems to only pull from applications that are currently installed on your phone, so if you bought a bunch of apps and only used them once before tossing them, they won’t clog up the recommendations. If you don’t want one of the recommended apps (say it’s one of those you already tossed), you can swipe and tap Remove, and it’ll disappear off the list. The App Store will also now allow you to redeem iTunes Gift Cards, codes, and certificates, although this functionality appears to be MIA at present. There’s also a new Top Grossing applications list in the Top 25 section of the store. 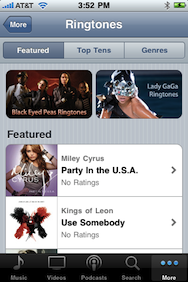 Glory be, you can buy Miley Cyrus ringtones at last. Oh, and others too. To the joy of many, and the dismay of probably just as many, Apple’s built Ringtone purchasing directly into the iPhone’s iTunes application. Just in case editing your own ringtones was too arduous a procedure to contemplate, you can now purchase ringtones from the iTunes Store. The iTunes Store will also now display any available iTunes account credits (in the App Store as well). You can now save a trim as a separate clip, hopefully cutting down on accidentally erasing footage. If you’ve ever found yourself furtively shaking your iPhone 3GS in the hopes of undoing an errant edit to a video you just shot, you’ll appreciate 3.1’s ability to save trims as a new clip. When you edit a video and tap Trim, a sheet will pop up giving you the option to either trim the original clip or save a new copy. Saving a new copy drops the edited version into your Camera Roll—you can then even edit it further, if you so desire. In addition, you can now save videos sent to you via Mail or MMS into your iPhone’s Camera Roll, as long as it’s of a compatible format, naturally. MobileMe subscribers can now remotely enter a passcode if they misplace their phone. iPhone 3.1 adds a couple of new security-related features. Setting a passcode has long been a good way to easily protect your iPhone’s data, but some users don’t like the hassle of having to enter a passcode every time they want to use their device. 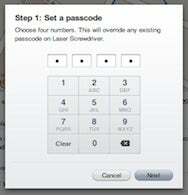 MobileMe subscribers, however, can now enable a passcode on their iPhones remotely. So even if you are one of those aforementioned folks who hasn’t bothered to enable the feature, you can quickly set lock your phone down if you misplace it. The feature is available via the Find My iPhone section of the MobileMe Web site. Apple also touted the addition of anti-phishing protections to iPhone 3.1, despite the fact that such features were originally advertised for iPhone 3.0. 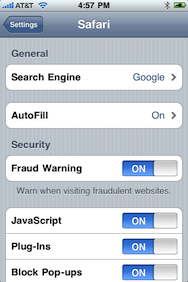 Settings -> Safari now has a Fraud Warning slider; when enabled, the user will be warned when visiting a suspicious Web site. Safari has an anti-phishing option in its settings to protect users from fraudulent Web sites. Of course, as with many software upgrades, iPhone 3.1 also patches a number of security issues under the hood. An issue with the CoreAudio framework that could lead to arbitrary code execution was fixed, as well as a problem with Exchange Support that could allow somebody with physical access to the device to use it to access data on an Exchange Server after the specified timeout period. An issue that made the rounds on several Web sites, where Spotlight allowed users to view e-mail messages after they’d been deleted, was also fixed. Apple also patched a vulnerability where a person with physical access to a locked device could still access data on it and a hole where service could potentially be interrupted via a maliciously crafted SMS message, which appears to be related to the earlier SMS vulnerability patched in the 3.0.1 update. An issue where passwords could be made visible by undoing deletion was also fixed, as were a handful of vulnerabilities in the WebKit framework. A number of other features get their due in iPhone 3.1. Apple’s improved Bluetooth performance when Wi-Fi is active and also enabled the ability to use the iPhone 3GS’s Voice Control feature via Bluetooth headsets, which should make that feature much more useful, especially for those who use Bluetooth headsets while driving. A new Home button feature makes the iPhone 3GS's accessibility options easier to get at. 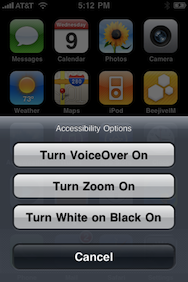 On the accessibility front, there’s a new option under Settings -> General -> Accessibility to allow certain of the iPhone 3GS's accessibility features to be activated by triple clicking the Home button. Users can specify that this should toggle the VoiceOver system, switch the display to the high-contrast white on black view, or ask the user what they want to do. If you choose the latter, then triple clicking the Home button will actually pop up a sheet with those two options as well as a third option: activating the iPhone’s zoom feature. The iPhone’s data detectors are pretty good at picking out phone numbers and letting you tap them to make a call, but sometimes it doesn’t quite recognize something correctly. In those cases, you’ll be glad to know that you can now paste a phone number into the Phone application’s keypad. Better yet, if you paste in a phone numbers that uses words, the Phone application will automatically translate it into numbers.